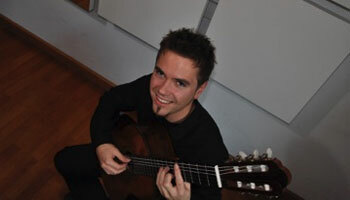 Born in 1985 Jörg Holzmann received his first guitar lessons at the age of seven. From 2005 to 2011 he studied classical guitar with Prof. Johannes Monno, chamber music with Sofia Kaltchev and jazz guitar with Werner Acker at the „Staatliche Hochschule für Musik und darstellende Kunst“ in Stuttgart. In 2011 he graduated with the highest mark possible. He has also taken part in a number of masterclasses with distinguished guitarists such as Leo Brouwer, Carlo Marchione, Judicael Perroy, Zoran Dukic, William Kanengiser, Berta Rojas, Olaf van Gonnissen and David Russel to name but a few. He has repeatedly received prizes at the German music competition for young people „Jugend musiziert“ and has been actively involved in numerous international festivals including „Forum Gitarre Wien“, „International Guitar Festival Split“, „International Guitar Festival Veria“, „Guitar Festival Calcutta“.